According to the updated roadmap leaked by VR-Zone, it looks like Intel has pushed forward the launch of their 14nm Broadwell processors to second half of 2014 while the Haswell refresh platform for desktop PC’s would be arriving in Q2 2014. There is some confusion built up regarding whether or not Intel plans to launch their 14nm Broadwell processors for the desktop platform. The answer is plain and simple, No! 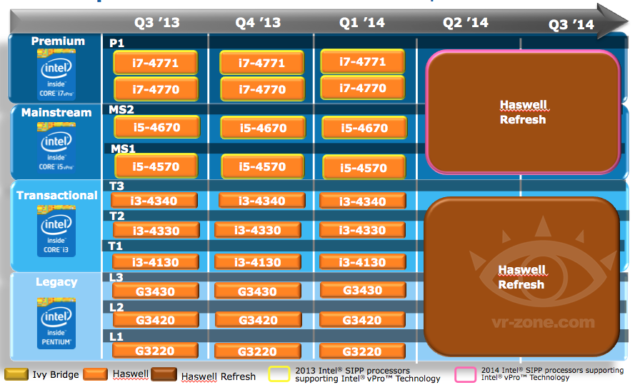 There’s no reason mentioned behind it but it looks like the PC folks would be limited to a Haswell refresh platform that would incorporate the 22nm design that is currently available on the Haswell platform. There would be a chipset change though, the new motherboards that would launch alongside the Haswell refresh platform would feature the Z97 and H97 chipsets which bring SATA Express and a few more updates as detailed here. Both the current and Haswell refresh processors would be compatible with the Z87 and Z97 chipsets featured on the LGA 1150 socket so i don’t think if its a thing any one should worry about. Yes, there’s the point that desktop folks would not get updated to TICK that Broadwell is supposed to be but Intel has a surprise for the PC folks. A year later after the unveiling of Broadwell, Intel would introduce their Skylake platform built on a new 14nm architecture featuring greater technologies such as PCI-e 4.0, SATA Express, DDR4 memory support, AVX 3.2 instruction and much more. Similarly, the HEDT platform “Haswell-E” would bring the same features such as DDR4 memory, PCI-e 4 and the latest 8 Core Extreme Edition processors. Skylake is the performance platform for 2015 while Haswell-E is the high-end platform for late 2014 by Intel. Currently, we are looking at the Ivy Bridge-E platform that launches on September 11th, more details on which can be found here. With the desktop side covered, let’s head on to the low wattage and ultra low power processor roadmap which is going to get updated in 2H of 2014. 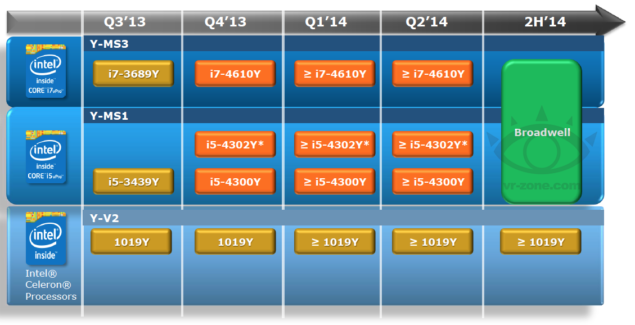 Along with the U and Y Series processors, Intel’s H-Series high-performance mobile chips would also get updated with the latest 14nm Broadwell architecture in 2H 2014. 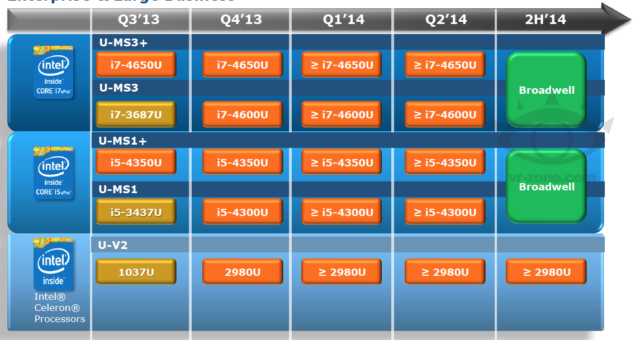 The roadmap also lists the Core i7-4960HQ as the successor to the current Core i7-4950HQ processor featuring enhanced clock speeds which arrives in early 2014.